Animal lovers around the country have found that they can make money from home easily doing something they love. Pet sitting is in demand! Pet owners are looking for a safe place to leave their animals when they go on vacation, others are looking for pet day care services, dog walking, pet grooming as well as many other services that are related to their beloved pets. Because most pets are considered members of the family, their owners want to leave them in the hands of someone who is an animal lover and one who can take care of the pet like it was their very own. The great thing about starting your own pet sitting business is that you do not need to look for a location. You can run the business right from your home with little to no hustle at all. There is great demand for the services you will be offering. This offers growth potential for your business as pet services are on a rapid growth curve. Since you love animals, you will have the joy of having them with you all day long. You do not have to worry about commuting to work and all the expenses in time and money that go into that. You will be meeting a need in your community, providing a service that will be helpful to pet owners and travelers in your area. To begin with you can be sure that you will be quite busy in the holiday season when everyone else is travelling. You may find yourself conflicted especially if you would rather to travelling as well instead of pet sitting. You will need to be conscious of the fact that some pets may have fleas or other bugs that you will be bringing into your home when you pet sit. You will need a ton of patience to deal with pet owners who tend to be quite fussy where their beloved pets are concerned. To start with you will need to make a list of potential clients in your area and how you will make them aware of the services you are offering. To gain the experience, I recommend starting a pet sitting service with Rover.com and DogVacay.com. Secondly, gather information on the inspection requirements and regulations that are set by your homeowners association and ensure that you are in compliance. Pet First Aid Kit for unexpected accidents or emergencies. Cleaning Supplies for basic clean ups and accidents. Spare collars and leashes for transporting pets. Towels and a large blanket comes in handy for transporting an injured pet. Portable pet carrier is needed to transport small cats or dogs. Poop Bags help keep the environment safe. Dog Treats and Toys will make a pet feel more comfortable. Make sure to consult with the pet owner first. Mileage Log to track all business miles you can claim on your taxes. Pet Sitting Business Forms which helps clients keep track of each visit. Notepad and Pen for taking important messages. Business Cards for networking. You'll never know when you may run into a pet lover while out on duty. Camera or smart phone to capture precious pet moments. Hone your skills on how to deal with unruly pets and also sick pets who may need special attention. Understand that you may need to work some unusual hours or may need to be on-call as needed. Starting Your Own Pet Sitting Business: The Complete Step-By-Step Guide – This is a complete, step-by-step guide that gives you all the information on how to start your own pet sitting business from home. 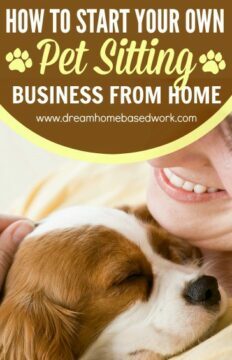 The author shares her personal journey of running a successful home based pet sitting business. How to Start a Dog Walking Business: An Entrepreneur's Guide to Starting a Successful Dog Walking or Pet Sitting Business – This guide focuses on teaching you everything you need to know about starting your own dog walking business. The Dog Walker & Pet Sitter Bible: A Recession-Proof Business Guide to Creating a Pet Service & Turning It Into a Six-Figure Income – Author, Colleen Safford wrote an awesome book on how to start create a professional pet sitting service. This guide will give you all the tools you need to turn your pet sitting business into a profitable career with low start up costs.